Posted in: Disney. Tagged: disney, disney world, friendship, mickey mouse. In good conscience, I feel I should warn you up front. This article probably won’t be very interesting at all. This article isn’t for you, it isn’t even for me. This is simply a tribute to my best friend in the whole world. Let me tell you the story of how we met. The last time the lady and I were in Florida, we made our routine stop at Downtown Disney. When you really think about it, Downtown Disney truly is the ideal place to go to get a true taste of Disney Magic. There are no rides, no games, and no characters walking around. All there is to do is eat and shop. It really bucks the trend of the usual routine, where Disney at least pretends to want to entertain you and make lasting memories for you and your family. So after buying the Mickey crotch cookie jar, we went into their “Everything’s Under $10” store. I love this store for the fact that you always think you’re getting a great deal, when in fact it’s just all the crap from other stores that normally costs less than ten bucks, all grouped together in one store. While in here, I met my destiny. I mean density. Wait. Uh, never mind. I came upon a shelf of solar powered bobble heads. 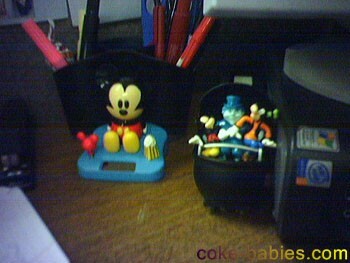 They had baby Dumbo, baby Stitch, baby Eeyore, baby Donald, and baby Mickey. These were the cutest things I have ever seen in my life. The biggest question was would it be Donald or Mickey? Donald is my favorite Disney character, so I figured it would be an easy call. 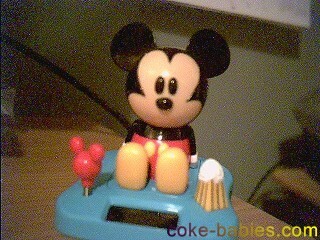 However, Donald’s smaller head had his bobble going at an alarmingly fast rate. 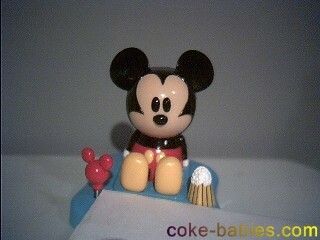 So after an embarrassingly long decision process, I went with Mickey. Or, more accurately, the present. I finally brought the bobble into work. I’m still somewhat new to my job, so my day consists of a couple hours of work that I am given, a short period of confusion as I don’t know what to do next, followed by about six hours of staring at a wall. But not any more. 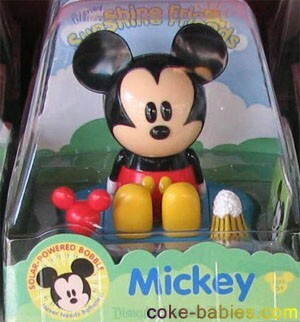 Now my new, awesome day consists of: a couple hours of work that I am given, a short period of confusion as I don’t know what to do next, followed by about six hours of staring at the Mickey bobble head. And yes I know it seems like it would get annoying. It would seem like that to someone like you. A non-believer. Someone who hasn’t had their life blessed by three inches of Disney magic. At least in the non-gross way. I will admit that sometimes the pleasant swaying does need to get changed up sometimes. I need to remix the bobble. When moments like these occur, a simple piece of paper to cover the solar panel is all I need. Once the darkened solar panel is drained of life, the Mickey becomes still. I remove the paper, giving life to the very thing which gives me inspiration throughout the day. Just like… The Circle of Life. Whoa. And, just like that, my day has been improved one hundredfold. And thus ends my tribute to my best friend, who gives me joy and the strength to go on, in the face of any adversity. What the hell has your best friend done? Get the hell out of here. Root beer floats for life.